Luke was a stunning, dramatic boy. Wolflike and intense, he commanded attention and respect. His coat was predominately black, with a strip of tan on his underbelly and a hint of creamy white fluff on his hind legs. Deep golden eyes pierced his ebony face and were rimmed under a dark tan whisper of an eyebrow. At first glance, you might have pegged him as fierce. He had the look of a warrior primed for battle, but despite his looks, Luke was a rather shy, sweet, and unassuming boy. But that might have been due to his circumstances, which perhaps masked his sweet, beautiful personality. Because on the inside, Luke was devastated. When I tuned into him, he told me that he was a wonderful boy, and he told me that I was right: there was a fierceness to him, but he kept it hidden because he didn’t want people to label him that way or shy away from him because of it. Most of us partition off certain aspects that we’re not ready to reveal about ourselves. We hide our flaws until we can trust enough to show our whole and true selves. For the first three years of his life, he lived with mom and dad, their children, and a German Shepherd brother. During that time, he’d known the security, love, and protection of a family. That all changed when his family was shattered by a painful divorce, and his future that once seemed so certain was altered forever. Luke was relinquished to rescue. Now he was scared, depressed, and insecure. The pain in his heart was unbearable. And even though he was embraced and loved in the rescue and showered with affection and attention, Luke longed for a family and a home to call his own. Heartbreak and sorrow were all too apparent in his eyes. When he was alone in his kennel, he retreated to a corner, perhaps dreaming of a home with another dog, children who would know how to properly treat a dog, and a family with some German Shepherd experience. But we sensed that he’d most likely be adopted quickly. He was not only stunning, but also reserved and well-mannered, although his looks would have conveyed otherwise. And in many ways, he was the ideal family dog: housebroken, socialized, and playful. His favorite thing was to play fetch with the volunteers, dodging their efforts to retrieve the ball and reveling in the game of chase that would ensue when volunteers would attempt to reclaim the ball from his mouth. And he was well-behaved in the car, settling peacefully in the back seat. He also knew some basic doggie obedience. Within days of joining rescue, it was apparent that Luke was floundering in the kennels. He became apathetic and lethargic. His appetite dwindled, and his depression worsened. So we quickly placed him in a foster home. In foster, Luke improved, but broken hearts are not healed overnight. And like most abandoned dogs, Luke must have been wondering, Why am I here? Where is my family? Who are these new people? As we predicted, it didn’t take long for our beautiful Luke to find a home. 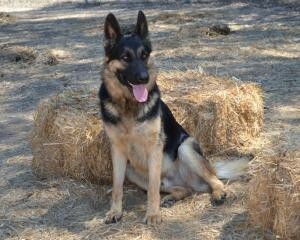 A previous adopter with two older female German Shepherd in her pack decided to add our handsome boy Luke into the mix. Because of his past, he is quick to form bonds. And the female GSDs in his new family seemed to sense that Luke needed time to ease into the meet-and-greet, so they quietly allowed him to sniff and get acquainted and feel comfortable. Within moments, Luke started to relax, and bonds began to form. Because Luke can be anxious and has a bit of separation anxiety, the two additional female GSDs as constant companions will help keep our boy feeling secure. His new mom is wonderful, calm, and experienced with German Shepherds. Luke’s new home is an extensive park-like property with tons of room to roam and squirrels to chase. Our Luke is in great hands! When I asked Luke how he was doing, he replied simply that he had never believed that what he’d had in his first home could ever be replaced but that he knew now that home is where the heart is, and he tells us that his heart is starting to heal.